80349 is an example of the final type of Travelling Post Office carriage which was a development of 80301 with smaller windows (after the mail train robbery in 1966). Full history to follow; never fitted with exchange equipment it nevertheless had sorting frames identical to 80301. 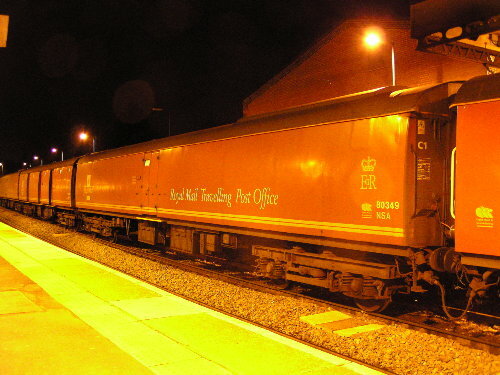 This vehicle lasted until the very end of TPO trains in January 2004, after which it was stored securely at Euston for possible preservation. RVP purchased it in 2006 as part of our Mark 1 TPO project, and it arrived on the GCR in early 2008. It has since been fitted with dual brakes (air and vacuum) and returned to service on the GCR in October 2008. A repaint in 1960's Royal Mail red is planned for late 2009.